Billy Talbot, best known as a founding member of Neil Young’s longtime backing band Crazy Horse, is releasing a new solo album, On The Road To Spearfish, May 21 on Vapor Records. In addition to the digital release of the nine-song set, a companion film chronicling the sessions—shot in HD—will be available. The album, his second with the Billy Talbot Band, was inspired by the open spaces of the North American prairie, where Talbot and his wife Karin have restored a historic homestead in Spearfish, South Dakota. In a musical journey that feels at once mortal and mythic—perhaps even mystic—Talbot translates the strength and beauty of the elemental Great Plains landscape into songs that transcend any specific geography. Rather, they inhabit the realms of the heart and soul, emanating a restless sense of wonder about the world of Spearfish and beyond. The album opens with “Empty Stadium,” a plaintive ballad driven by a longing for home—the real and metaphorical Spearfish. It is followed by the up-tempo groove of what will be the album’s lead track, “Running Around,” a song about searching for a better place. That yearning is felt throughout the set list in songs that that juxtapose despair and redemption, range from somber to psychedelic, and that span the distances in between—with an overall progression from darkness to light. The spirit of what Talbot has helped create with Neil Young and Crazy Horse—with whom he is currently on tour—also flows through the record, nowhere more fully than on the title track. Spacious and awash in guitar interplay, “On The Road To Spearfish” is an epic anthem to the open plain that clocks in at almost 13 minutes. It came to Talbot after watching the first episode of the HBO western series Deadwood, in which a family of Squareheads—a slur for Swedish immigrants—was massacred. The tragedy happened “on the road to Spearfish,” which is just 15 miles from the actual town of Deadwood, SD, and about 70 miles from where Talbot’s wife Karin—who is of Swedish descent—is from (and, incidentally, only an hour north of the monumental Crazy Horse Memorial in the Black Hills). The song mourns the West that once was, while still seeking solace in what will never fade away. 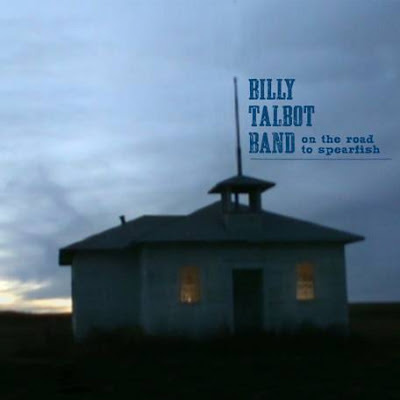 On The Road To Spearfish follows up the Billy Talbot Band’s 2004 album Alive In The Spirit World. With the addition of newcomer Ryan James Holzer on trombone, harmonica, autoharp, organ, and acoustic guitar, the same versatile musicians join Talbot for On The Road To Spearfish. They include guitarist Matt Piucci (formerly of Rain Parade and Moving Sidewalks), Erik Pearson (horns, banjo, lap steel), Mark Hanley (lap steel, mandolin, and guitar), Tommy Carns (bass), and Stephan Junca on drums. Using vintage gear and an eclectic orchestra of acoustic and electric instruments, the new album was recorded at Light Rail Studios in a repurposed warehouse in the Potrero Hill district of San Francisco. The road that led Talbot to Spearfish began a continent away on the lower west side of Manhattan where he was born. He started his first vocal group at age 14, singing on street corners and in the hallways of the old Hudson Tubes, which now house the PATH Trains connecting New York City and Hoboken. Talbot quit high school as a sophomore, and at 17 hopped a bus to L.A., where his mother—a nightclub singer who always encouraged his musical pursuits—and brother had moved two years earlier. In late ’62, he met Danny Whitten at a club on the Sunset Strip, and they began singing doo wop as Danny and the Memories. When Ralph Molina joined the line-up, the core of what would become the original Crazy Horse was in place. The group evolved into The Rockets, and in 1967, Neil Young—then in Buffalo Springfield—sat in on a gig of theirs at The Whisky. Shortly afterwards, Young invited them to be his backing band—under the new name Crazy Horse—for his second solo album, 1969’s Everybody Knows This is Nowhere. Whitten passed away in 1971, and Frank “Poncho” Sampedro joined in 1974. They have been central to every incarnation of Crazy Horse since, both on its own, and backing up Young—with the latter, on many epic tours and almost two dozen albums. Preview tracks of Billy Talbot Band - On The Road To Spearfish . Billy's got a great bunch of musicianship on here. Nice job, Billy! Enjoying Listening to Billy's new album. Love "Cold Wind" and "Miller Drive" too, "Empty Stadium" is engaging and "Spearfish" is a masterpiece...thanks Billy very much. Great bunch of musicians and I especially like the work of young Ryan James Holzer! A 'masterpiece' aren't we all getting engulfed in the Horse hype?